This idea that escharotics can "draw out" cancers from underneath the skin is preposterous. Furthermore, even if a product could do this, it could not influence cancers that have spread (metastasized) to distant regions of the body. Some currently marketed escharotics contain bloodroot (Sanguinaria candensis), zinc chloride, or both. However, because cancer salves are not manufactured under government supervision, it may not even be possible to know what is in them. People who use such products without benefit of medical consultation run additional risks. Untrained individuals may incorrectly conclude that a growth is cancerous when it is not. Skin cancers that can spread should be medically investigated to see whether they have done so, and some of these require extensive treatment even though they might not look dangerous to the naked eye. In addition, although escharotics may appear to destroy cancers on the surface of the skin, the user will not be able to tell whether cancer remains under the skin where it can continue to grow without immediate detection. In 2002, the Archives of Dermatology published a report of four patients who had used escharotic agents instead of standard treatment for a basal cell cancer . In the first patient, the visible tumor was removed and the skin healed. However, a biopsy several months later a biopsy showed that cancer remained under the skin. The second patient successfully eradicated his tumors but sustained severe scarring that required surgery to repair. The third patient had successful surgery for several tumors but was unhappy about tiny scars and the cost of the procedures. When last seen by the authors, he had 2 large swellings covered with a thick central eschar, one on each side of his neck as a result of treatment by an "herbalist." The fourth patient came to the authors with a large basal cell cancer of the nose, lip, and cheek that required extensive surgery to remove and later metastasized to his bones. Several years earlier, when the cancer was in its early stages, he had refused surgery and chosen instead to treat it with an escharotic. The cancer appeared to have been healed, but obviously was not. The authors warned that many of the skin disorders referred to in testimonials published on Web sites that market escharotics were not medically diagnosed so that it would not be possible to judge whether they were benign growths or, if cancerous, had actually been cured. The extreme danger of using escharotics products is illustrated by the experience of Ruth Conrad, an Idaho woman who consulted one of the state's many unlicensed naturopaths in 1984. While seeking treatment for a sore shoulder, she also complained of a bump on her nose. The naturopath stated that it was cancer and gave her a black herbal salve to apply directly. Within a few days, her face became very painful and she developed red streaks that ran down her cheeks. Her anxious phone call to the naturopath brought the explanation that the presence of the lines was a good sign because they "resemble a crab, and cancer is a crab." He also advised her to apply more of the black salve. Within a week, a large part of her face, including her nose, sloughed off. It took 3 years and 17 plastic surgery operations to reconstruct her face. During a deposition, the naturopath stated that he had obtained the salve from a woman in Mexico and that he didn't know who had manufactured it. The picture shows the extent of the injured area. Later in 2005, Lois March, M.D., an ear, nose, and throat specialist who practiced in Cotrell, Georgia, surrendered her medical license to settle charges that she improperly helped Dan Raber, an unlicensed person who treated patients for cancer. Georgia’s Composite Board of Medical Examiners had accused March of providing pain management to several patients whom Raber treated with a bloodroot paste, including one man whose flesh was eaten so badly from his shoulder that the bone was exposed [5,6]. Press reports indicate that the FDA raided Raber's farm . In 2007, after March participated in rehabilitative activities, board reinstated her license with an agreement that called for her to continue to have counseling for two more years . In April 2006, the FDA ordered Risingsun Health Alternatives and Herbs, a division of MacAdam Health Enterprises of Livingston, Montana, to stop its illegal marketing of Cansema products . Although the company owner promised several times to stop the illegal marketing, he did not stop. After making several undercover purchases, the FDA obtained a consent decree for a permanent injunction [10,11]. The company responded by removing the illegal claims but continued to sell black salve products. The FDA warned that this type of "disclaimer" would not protect against prosecution because other parts of the site (including metatags), had made it clear that the products were intended to treat cancer . In September 2008, the Federal Trade Commission secured a consent agreement with Holly A. Bacon (d/b/a Cleansing Time Pro), who had marketed " black salve" ointment and tablets with claims that both products were effective against all forms of cancer, as well as against hepatitis, HIV, SARS, and Avian Flu and other viruses. The agreement bans her from making unsubstantiated claims about any product . In 2013, a Missouri court ordered Samual A. Girod to stop marketing TO-MORE-GONE (a salve that contained bloodroot) and two other products for which he was making illegal trherapeutic claims. When he continued to sell them, the FDA initiated a criminal prosecution that resulted in a six-year prison sentence . Australia's Therapeutic Goods Administration (2012) and New Zealand's Medicines and Medical Devices Safety Authority (MEDSAFE) (2013) have issued warnings against the use of black salves and other caustic products to treat skin problems [15,16]. The New Zealand report summarizes the outcomes of 13 cases reported in medical journals between 2001 and 2010. Most had very bad cosmetic results, and at least five had recurrence of their cancer. Weil does not mention how he determined that medical students who followed his advice had "consistent and satisfactory outcomes." Some skin cancers that are left behind will not become apparent until months or even years after they are treated. Without a formal follow-up study, it is impossible to determine the long-term outcome. The book Natural Causes describes what happened after Weil's Web site persuaded Sue Gilliatt of Indianapolis, Indiana to use bloodroot products. According to the book, her primary care physician removed a bump on her nose that was diagnosed as a benign tumor called a fibroadenoma. But Gilliatt feared that it was cancerous and, even though she was given a referral to a dermatologist, wound up buying Cansema from the Alpha Omega Alpha Web site and a bloodroot paste from Dan Raber. The Cancema stung so badly that she was unable to keep in on for the recommended 24 hours and applied Raber's paste instead. Within a few hours after she applied it to her nose, her face became puffy and her eyes were nearly swollen shut. Instead of consulting her doctor, she phoned Raber who persuaded her to apply more paste. Six days later, when she had her appointment with the dermatologist, a large part of her nose had been destroyed. Gail Bumpus, of Singer Island, Florida, was the victim of 84-year-old Jerome Craft, M.D., a board-certified plastic surgeon who advertised in the Yellow Pages as a specialist in cancer and burns. In 2005, she consulted him about possible surgery for excess skin under her nose. During the first two visits, without taking a biopsy, Craft said that she had extensive cancer in the nose and that a black salve that he had invented would remove the cancer without leaving any scars. After the salve was applied, her nose became extremely painful and her face swelled "like a pumpkin." Although an emergency room physician advised hospitalization, Craft talked her into remaining under his care for ten more days, during which time she experienced excruciating pain but was reassured that she would be fine. When she finally returned to the hospital, she was admitted for five days and treated with massive doses of antibiotics. When the dead tissue was removed from her nasal area, it was apparent that her nose had been burned off. So far she has had six operations to reconstruct a nose. In 2007, the Florida Board of Medicine secured a consent agreement under which Craft was reprimanded, fined $9,000, ordered to pay administrative costs, and banned from using "black salve" again . Craft died in August 2007. In 2006, a woman in Liberty Hill, Texas, developed a small but deep-rooted cancer on the skin of her nose that was biopsied and diagnosed by a dermatologist. Surgery was recommended, but her sister, who has practiced as a "master herbalist" for many years, persuaded her that a bloodroot paste would do a better job. The first picture shows how her nose and the surrounding skin became inflamed. The second picture shows the hole in her nose that resulted. The paste destroyed some areas of bone and cartilage, which meant that when the wound healed, she required extensive plastic surgery. She also reported that the inflamed area was extremely painful for more than a week. In 2014, the Medical Journal of Australia reported the case of a 55-year-old man who had applied a bloodroot-containing black salve product to a spot on his right temple that he believed was cancerous . Over a 4-month period, the salve burned a 1-inch-wide hole in his head that was so painful that he took narcotic pain medication. He finally sought medical care and was instructed how to care for his wound, which took three months to heal . In 2015, a jury in Montana awarded $139,500 plus costs to Tina McColl for damage caused by a black salve administered by naturopath Michael Lang. Court documents indicate that in 2012, after Lang applied the salve to treat a blemish on McColl's nose, she developed a dime-sized third-degree burn that required plastic surgery and periodic injections to retore and maintain her appearance. McColl appealed the verdict in an effort to have punitive damages added, but the appeal court denied her appeal . Mohs micrographic surgery is a state-of-the-art treatment for superficial skin cancers (basal cell and squamous carcinomas) in which the physician (usually a dermatologist) serves as surgeon, pathologist, and reconstructive surgeon. It begins with surgical removal of the visible tumor and microscopic examination of the specimen. If cancer is seen at the margins, the suspected area plus a thin margin is removed and the process is repeated until it appears that all of the cancer has been located and removed. The end result is a very high cure rate (over 99% for new cancers and 95% for recurrent cancers) with minimal removal of healthy tissue . Melanomas, which are much more dangerous, usually require more extensive surgery. I have had basal cell carcinomas removed from my nose and cheek with Mohs surgery that left no visible scar. Skin cancers should be medically diagnosed and treated. Basal and squamous cell carcinomas located in readily visible areas (eyes, nose, lips, or scalp) may be suitable for Mohs surgery. Melanomas usually require more extensive surgery. The types of products described in this article are extremely dangerous. Their sellers deserve to be imprisoned. McDaniel S. Goldman GD. Consequences of using escharotic agents as primary treatment for nonmelanoma skin cancer. Archives of Dermatology 138:1593-1596, 2002. Flesh-eating paste promoted as cancer cure. New York Times, Aug 29, 2005. Complaint for permanent injunction. USA v. Toby Carl McAdam and Greta Armstrong, d/b/a/ Rising Sun Health. Case 1:10-cv-00128-RFC. U.S. District Court for the District of Montana. Filed Oct 13, 2010. Consent decree of permanent injunction. USA v. Toby Carl McAdam and Greta Armstrong, d/b/a/ Rising Sun Health. Case 1:10-cv-00128-RFC. U.S. District Court for the District of Montana. Filed Oct 13, 2010. Cassens B. Warning letter to Best on Earth Products, May 20, 2008. Agreement containing consent order. In the matter of Holly A. Bacon, doing business as Cleansing Time Pro. FTC file # 082-3119, announced Sept 18, 2008. Barrett S. Defiant black salve seller gets six-year prison sentence. Cancer Treatment Watch, July 10, 2017. Black and red salves in treating cancer. Australian Therapeutic Goods Administration, March 19, 2012. Black salve – Buyer beware. MEDSAFE, Dec 3, 2013. Bracy DR. Warning letter to Stan Weinberger, April 17, 2017. Ong NC and others. Use of unlicensed salve for cutaneous malignancy. Medical journal of Australia 200:314, 2014. 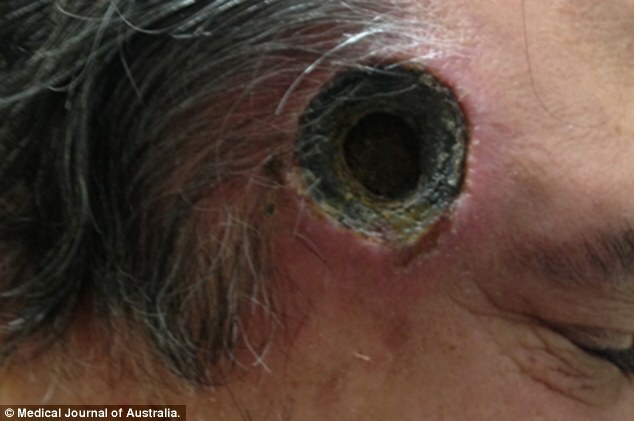 Malm S. Man left with an inch-wide HOLE in his head after using 'quack' ointment to treat skin cancer. Daily Mail, April 6, 2014. Opinion. McColl v. Michael Lang, N.D. and Nature's Wisdom. Montana Supreme Court case number DA 15-0589, filed Nov 11, 2016. This article was revised on November 18, 2017.